Editor’s Note: This recap is brought to you by our partners at KontrolFreek. Use code “INTEL” for 10% off your next purchase. 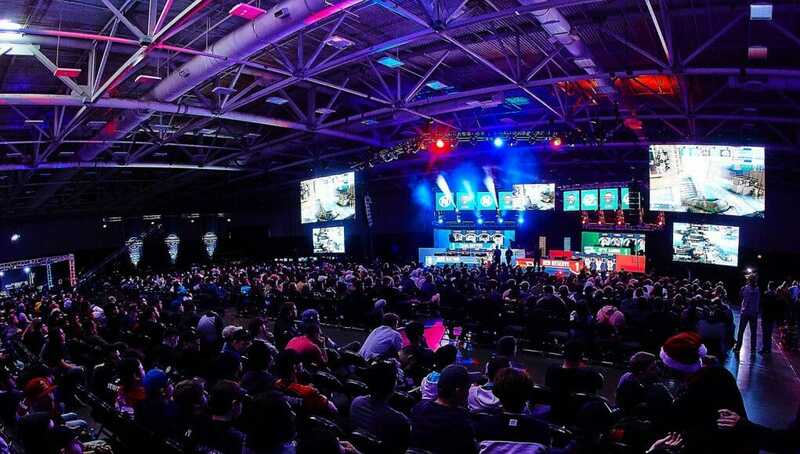 The first CWL event of the 2018 season was this weekend, as over 200 teams came to Dallas, TX for the Call of Duty World League, presented by PlayStation 4 CWL Dallas Open event featuring a $200,000 prize pool. After an intense three days of Call of Duty: WWII action, Team Kaliber emerged victorious, securing a win for the first time in a few years at a Call of Duty esports event. 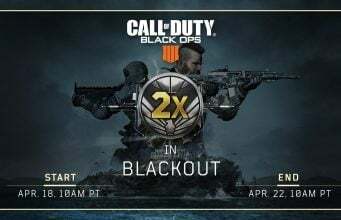 The open bracket was the largest open event in Call of Duty esports history, with over 200 teams competing on Friday. 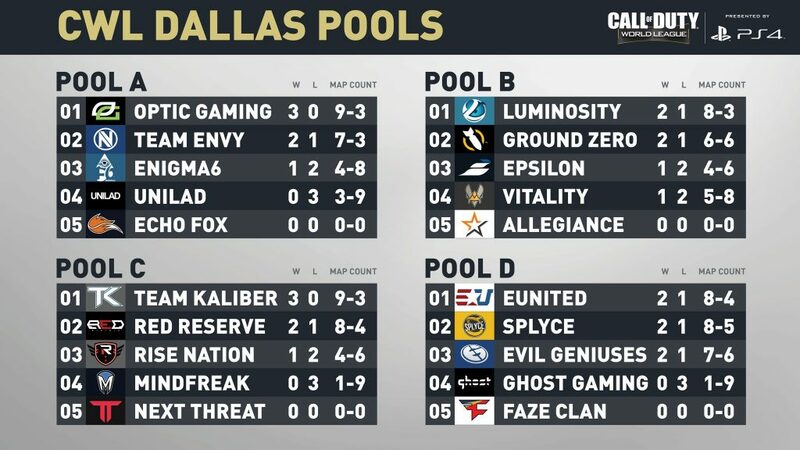 The top 4 open bracket teams, after a lengthy play time, ended up in the Groups above: EchoFox was placed in Group A, Team Allegiance in Group B, Team Next Threat in Group C, and FaZe Clan in Group D.
Following an intense Saturday of additional pool play matches, here was the final pool play standings. 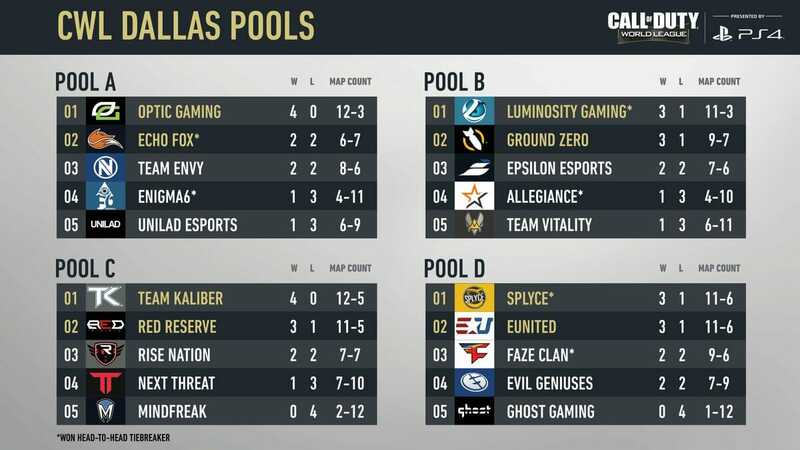 OpTic Gaming and Team Kaliber had a 4-0 Pool Record in their respective groups, joined by Luminosity and Splyce being at the top of their groups. The teams were then placed into the Winners and Losers Bracket. Following the pool play matches, the Winners Bracket was set. In the first match, OpTic Gaming took it with ease with a 3-1 win over Red Reserve. Team Kaliber also had a strong start in the Winners Bracket, forcing Echo Fox to the losers bracket with 3-1 win. Splyce and Luminosity pushed forward in the bracket with their own wins in Round 1. The action heated up as we moved to the Winners Semi-Finals matchup. 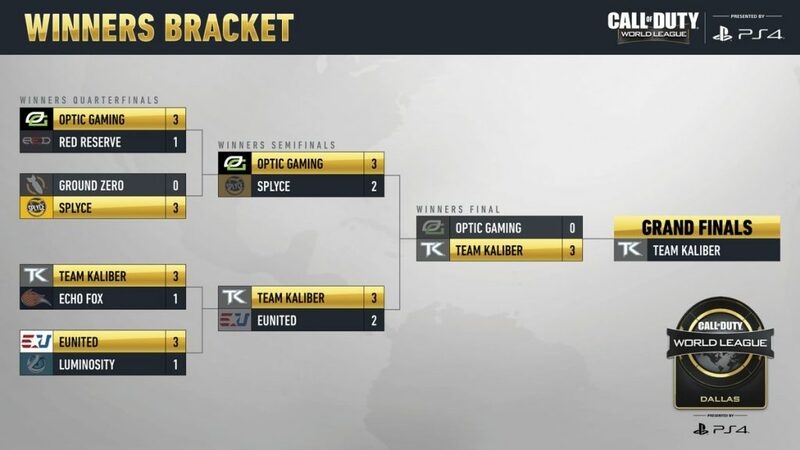 The Team Kaliber vs. eUnited match went all the way to the final deciding Game 5, as Team Kaliber emerged victorious and moved forward to the winners bracket finals. The OpTic Gaming vs. Splyce match started off heavily in Splyce’s favor, as they put OpTic Gaming in the 100 point club in Game 1 Hardpoint. OpTic Gaming recovered in Game 2 to tie up the series 1-1. 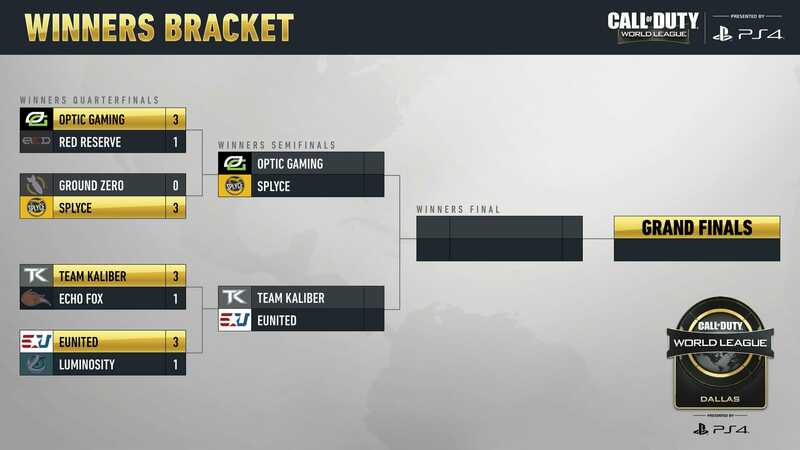 This series also went to a Game 5, and end in OpTic Gaming’s favor, as they advanced to the Winners Bracket Finals to face Team Kaliber. 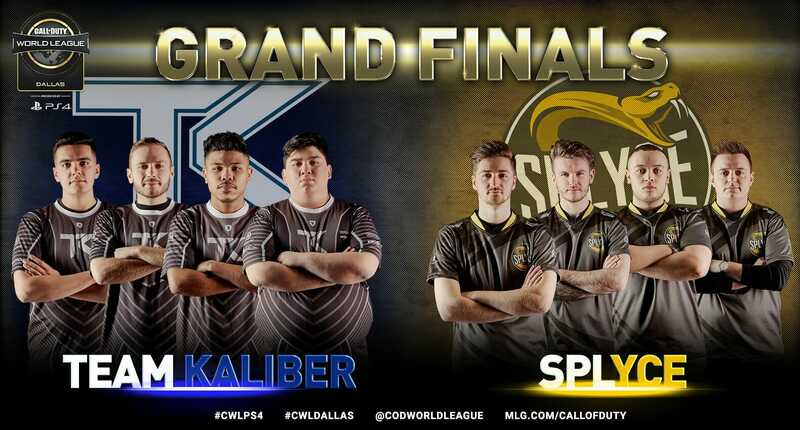 Team Kaliber continued their incredible performance in the Winners Bracket, as they took down OpTic Gaming 3-0 to advance to the CWL Dallas Grand Finals. 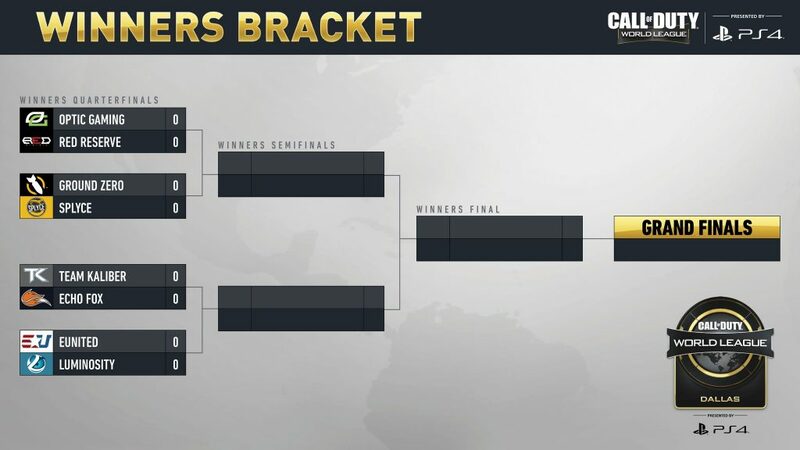 In the losers bracket, FaZe Clan had a remarkable run. They started there on Saturday and forced their way all the way to the losers semifinals to match up against Splyce. Splyce, the only EU team left, eliminated FaZe Clan from the event with a 3-2 win. FaZe finished in 4th. Backs against the wall, OpTic Gaming had a rematch against Splyce in the Losers Bracket Finals. 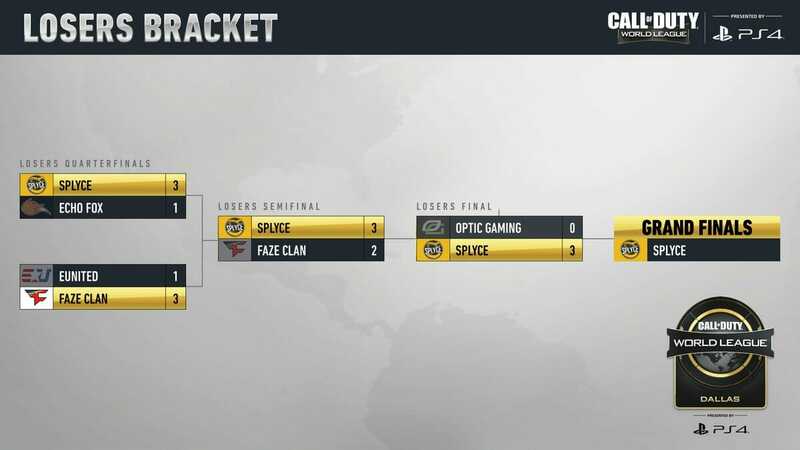 OpTic Gaming seemed unable to recover from their Winners Bracket match, as Splyce took this series with a quick 3-0 to face Team Kaliber in the Grand Finals. OpTic Gaming, the 2017 CWL Champs, finished in 3rd at CWL Dallas. Team Kaliber started off strong in the series, taking a quick 2-0 series lead. Team Kaliber looked unstoppable, but Splyce was not done yet. They came back all the way in the first series to force a Game 5 in the series. 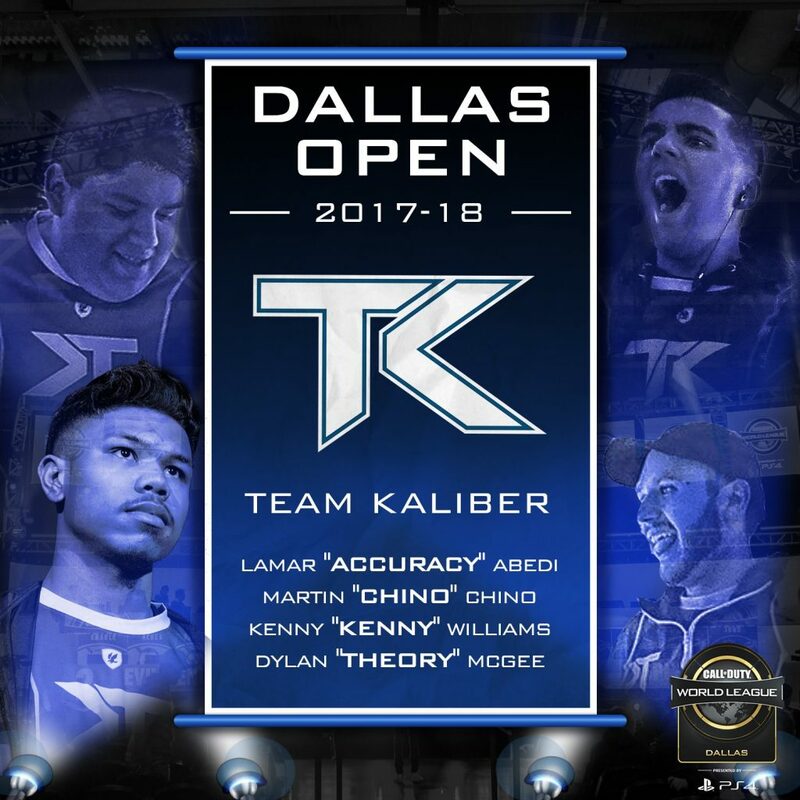 In the final game 5, Team Kaliber won it and were crowned the 2017-18 Call of Duty World League Dallas Open Champions! 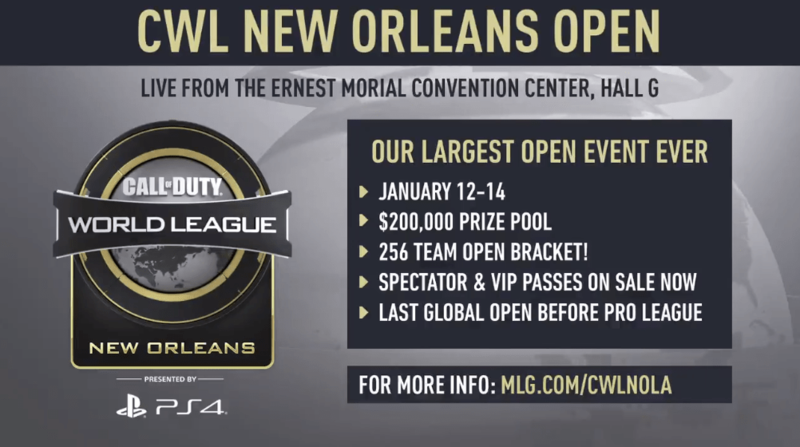 The Call of Duty World League, presented by PlayStation 4 2018 season continues on January 12-14 with the CWL New Orleans open event, which features a $200,000 prize pool and the largest open bracket in Call of Duty history, with over 256 teams competing. Spectator Passes are still available at MLG.com/CWLNOLA. Stay tuned for the latest Call of Duty World League news.